Signed by the artist and dated ’55 lower left. Stanley R. Stangren (1928 – 2014) was an American jeweler, artist, sculptor and ceramist, residing in New York City. He worked in different styles and in different materials, including oils, watercolor, ceramic and stone sculptures; and fine jewelry. Stangren’s painting styles varied tremendously – from complete abstract works to Holocaust themes in the style of Georges Rouault and Hieronymus Bosch to portraits in the style of Moses and Raphael Soyer. He was also a passionate lover of the performing arts, and, as a young man, spent time studying dance at both the School of American Ballet and with Martha Graham. Although he worked with dance pioneers like Ms. Graham, Anna Sokolow and Charles Weidman, an injury prevented him from pursuing dance as a career. But he found other outlets for his artistic pursuits. In his youth, Stangren attended the Brooklyn Museum School of Art, and graduated from the High School of Music and Art in New York City. He later studied at the Boston Museum of Fine Arts, the Art Students League, Bard College and in Europe. Stangren studied jewelry design in Europe, attending Staatlische Kunst Werkschule in Pforzheim, Germany and Kunstgewerbeschule der Stadt in Zurich, Switzerland. His jewelry and designs were received with great success. His combination of precious and semi-precious stones, high-karat gold and sterling silver, and exotic materials executed with outstanding workmanship in the abstract modernist style gave a unique aspect to his designs, the metalwork usually electroformed, cast, or fused in varying textures. After returning to New York in the later 1950’s, Stangren opened and maintained a ceramic business in Trenton, New Jersey. Very few pieces of his work remain from this period. When he retired from the ceramics business, he spent much of his time enjoying the arts. He frequently attended Juilliard performances, including most of the opera and drama presentations at the School, and was especially fond of the dance concerts. The last 40 years of his life, he taught painting in the New York area and worked with Metropolitan Museum of Arts in developing annuities, for future acquisitions. Inb addition, Stangren left annuities for MoMa in support of educational programs and left, in his will or through his execuitors, art supplies for the Harlem School of Art and benefits for the Urban Assembly organization. Mr. Stangren's love for the arts and for the performances he was seeing at Juilliard inspired him to take his participation a step further and to establish charitable gift annuities with the School. "I realized what Juilliard offered me, being a passionate music lover, and I decided to give something back" he said. "What Juilliard achieves is remarkable. When I think of the prominent actors, dancers and musicians that have been educated there, I am always staggered. It is deeply financially satisfying to be able to give back to the School, while benefitting from it at the same time." The Juilliard School is not the only organization that Stanley Stangren supported. He has established gift annuities at a number of other nonprofits, including the Metropolitan Museum, the American Civil Liberties Union, the Children's Aid Society and the New York City Opera. This exquisite and very unusual sculptural majolica bust of a woman, wearing a coral necklace and a bright head scarf with a floral print was made in the last quarter of XIX Century in Portugal. Due to the peculiarities of the material and realistically rendered image, the skillfully selected colors under the well-preserved glaze are still pleasing to the eye with their brightness and freshness, creating an amazing life-like effect. Though clearly marked on the bottom with a circular crest and a bee (fly?) on top, we could not establish the name of the artist/maker. In excellent antique condition with no breaks, repairs or restorations except some slight chips along back edges of both earrings (easy to restore, sold as is). This beautiful grand and highly decorative Art Nouveau ceramic vase is outstanding by all measures. 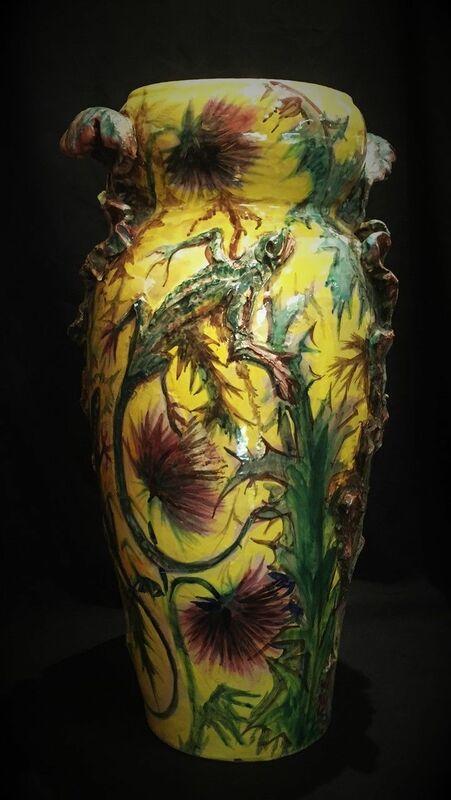 It is fabulously rendered in the most unusual technique, combining a hand painted thicket of life-like thistles flowers with overlaid leaves and lizards crawling among them. The two handles on the top of the vase are formed by the curled tops of the large thistles leaves, it's beautiful organic lines very characteristic of the French Art Nouveau aesthetics.